Choosing to go to therapy can be a difficult decision. Change is hard and takes some level of commitment and resolve to achieve. Nevertheless, therapy can be a tremendous opportunity to improve your personal insight and awareness, learn new skills/tools to help you in your life, and gain needed support during times of adversity. But how does one choose the best therapist? What should you be looking for? The following recommendations can help you hone in on the factors that will matter most to you and ensure that you are finding the ideal “fit” for you and your needs. Every client and every therapist comes to the table with their own unique stories, experiences, style, and expertise. Although we can, to an extent, alter our personalities and ways of relating to people, it is unlikely that you or your therapist will fundamentally shift very far from your inherent personality type. That is why I often tell people that you might find the smartest, most experienced therapist in the world, but you won’t get very far in therapy unless your personalities are compatible. Does your therapist share enough of your own values that you can speak openly about the aspects of your life that are intimate, personal, and significant? For instance, does your therapist share a similar faith background if you want to address spiritual issues? Are you a part of the LGBTQ community looking for an open and affirming space? These will be important questions to consider because you want to be able to trust the feedback your therapist gives. If you present a particular problem in therapy and your therapist provides feedback that conflicts with your values, you might be less likely to accept the feedback. Thus it is important to begin identifying what sorts of values you want your therapist to have. If you are a pregnant mom who desires a home birth, don’t choose a therapist that will constantly be urging you to pursue a hospital birth. If you approach life from a holistic perspective, choose a therapist that will operate from a similar values system. The best way to determine the best “fit” from a values perspective is to simply ask your therapist their perspective on various issues that are important to you. Ideally you can do this in an introductory session before you get too far into therapy. 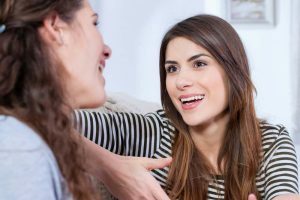 Keep in mind that your therapist might not always answer personal questions about themselves, but you can certainly ask about any values your believe will be relevant to your therapy process. You are more likely to follow through on recommendations that make sense to you, so check out how compatible your values are with your potential therapist. Whereas we certainly want personality and values to match up between client and therapist, that does not mean you must agree on everything. You want a therapist who is going to challenge you, stretch you, and guide you toward your desired goals. You don’t want someone who is going to always tell you you’re right or agree with every decision you make. We cannot consider alternative ways of viewing or dealing with a situation if such alternatives are not presented to us as possibilities. Consider how you might choose a coach to help you improve your performance in an activity. You would never go to a coach that would tell you that you train or do things perfectly every time. There would be no challenge to grow or change. You would simply stay the same and thus never achieve the improvement you desire. You want a therapist who will support the efforts you make toward your goals, encourage you to persist when times are difficult, and ultimately offer unique perspectives on what changes are needed in order for you to improve. We often need to hear different opinions to help us arrive at the best and most considered conclusion for ourselves. Your therapist should be someone you grow to trust, and this includes knowing they will always tell you the truth (even if the truth is not easy to hear). You certainly want your therapist to challenge you or present alternative perspectives in a helpful and perhaps even a sensitive way. However, you do want a therapist that will prompt you to see situations, problems, people, or solutions from a perspective that might be different from your own. We all learn, grow, and gain inspiration in different ways. Perhaps you are a person who doesn’t like to be “told what to do” or receive advice from others about your life. You might respond best to a therapist who will listen, reflect, and provide non-directive guidance (e.g. Presents a range of options/solutions without guiding you toward specific ones). Or you might be a person who is more achievement oriented and thus respond best to concrete, practical step-by-step guidance. You might want a therapist who provides structured plans for problem-solving, specific “homework” tasks to work on in between sessions, and an emphasis on tracking your progress on a regular basis. Perhaps you want someone who rarely has an agenda and instead meets you where you are emotionally to discuss any topic you wish without making specific action plans. There is not one approach that works for everybody. It comes down to your individual preference, personality makeup, and learning style. Ask your potential therapist about their style of approaching problems and solutions. You can ask whether they prioritize structured goal achievement or less structured personal reflection. Many therapists can do both to an extent, but often have a leaning toward one particular style. If you want to avoid frustration with your therapy journey, find out if your therapist will travel the same way you will on said journey. At the end of the day, no one can tell you who the best therapist is for you. Certainly you should consider recommendations and referrals other people might offer you, but your decision must be a personal one. Changing any part of your life can be a challenging endeavor, but you can effectively make the progress you desire by making careful and intentional decisions about who is going to help you. Interviewing several therapists can be helpful if you’ve never tried therapy before or if you simply want to know your various options. Regardless, using the suggestions above can help guide you toward the ideal “fit,” ultimately giving you the best possible therapy experience.